The Avalanche 1000 is designed for the most demanding customers who require solid 24/7 “mass-production at lightning speed” performance. 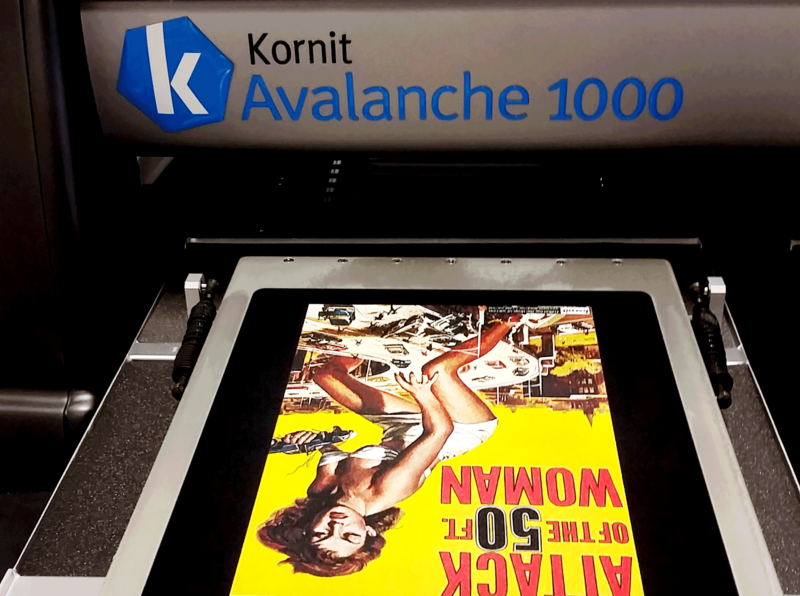 Kornit has created a genuinely different approach that handles volume and delivers incredible quality, at an extremely low operational cost. This dual pallet industrial-grade device is designed for heavy-duty use. The print-head array features 24 Spectra Polaris heads allowing very high speeds and excellent print quality. The machine is resistant to daily climate variations because of an integrated humidifying system. A back-up battery system even allows the main power to be turned off when the machine is not being used. The print area is up to 23.5x35 in (ie.60x90cm) allowing XXL garments, a wide variety of textiles that range from light to dark. An automatic height adjustment mechanism allows printing over buttons, zippers and other protruding objects, at a rate of up to 300 light and 170 dark garments per hour. It includes NeoPigmentTM 5 colour process with integrated pretreatment for unsurpassed quality. Throughput (shirts/hr) Light garments:Up to 300, Dark garments:Up to 170.